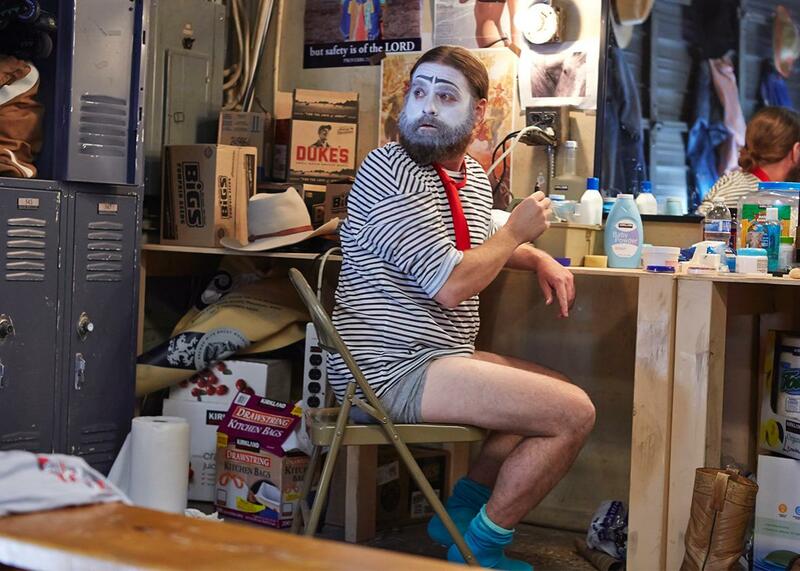 FX’s Baskets with Zach Galifianakis, reviewed. FX’s Baskets is moving and deeply sad. Too bad it’s framed as a comedy. Zach Galifianakis rose to fame in the broishly uproarious The Hangover, an unexpected hit that turned its stars into stars. (At least temporarily. Where have you gone, Ed Helms?) Galifianakis played a stone-cold idiot afire with comedic timing. His character was a wild man, but unlike Jim Belushi or Chris Farley, other rowdies with contagious presence, Galifianakis’ performance was shot through with pure weirdness. A perverse and overgrown cherub, he said strange things with disorienting matter-of-factness—clueless and menacing, innocent and dangerous all at once. In Galifianakis’ best-known work since The Hangover (excluding the mandated sequels), he further developed his weirdo vibe. On Between Two Ferns, the lo-fi Internet talk show, Galifianakis conducts awkward and unthinkingly antagonistic interviews with celebrity guests (and the president) who are in on the joke. Galifianakis’ interviewer is so fixated on what he is doing that he has no self-awareness. His questions can be rude, go ignored, or fall flat, but it’s all the same to him. Galifianakis’ comedy is pleasing to people exactly to the extent that his characters are wholly oblivious to people-pleasing. Chip Baskets, the sad clown that Galifianakis plays in FX’s Baskets, which premieres Thursday, is also myopically self-interested. Co-created with Louis C.K. and Jonathan Krisel, Baskets begins as Chip bombs out of an elite French clown school and heads back to his hometown of Bakersfield, California, broke. He has a green-card wife who doesn’t love him and a passion to continue working as a highbrow clown named Renoir. But the only work Chip can find is at the local rodeo, where he attempts the sophisticated clowning he’s not very good at, even though the crowd just wants to see him get stomped by the bulls. Like Louie, Baskets is a downbeat and sometimes surreal study of a middle-aged guy trying to make it through life. But Baskets is not filtered through the sensibility of a stand-up. There are no set pieces, arguments, or punch lines, just Galifianakis’ M.O. : an oddball devoted to his own oddities, spraying behavioral quirks every which way. When the show works as a comedy—which it does at about a 30-70 ratio—it’s all about an accumulation of silliness, delivered with a straight and yearning face, rather than clear-eyed observation. In an emblematic bit, funnier to watch the fourth time around than the first, Chip and Martha (stand-up Martha Kelly)—a Costco employee and insurance wiz who becomes Chip’s only friend—roll up to a drive-thru where Chip, via Martha, tries and fails to order Tangerine Fanta, Tab, Pepsi Lime, new Coke, and Schweppes, at which point he gets so agitated that he moves to the driver’s seat and then requests a “milk water like a Yoo-hoo,” “anything from the Slice family,” “anything from the Welch’s family,” and “anything that has Baja Blast in it, “ before finally settling for water. Chip’s exasperation, which is immense, is only ever at the fast-food place’s paltry beverage choices. It never occurs to him that he, hunting for new Coke, might be to blame. Baskets will be very funny to some people—I watched the first five episodes next to someone who couldn’t stop laughing at it, and I’ll admit this might have kindly disposed me to the show; you know what they say about laughter as a contagion— but not everyone. Chip is a strange, depressed bird who has devoted his life to something he’s bad at, who is in love with a woman who doesn’t care about him, while being cared for by women he’s reflexively obnoxious to: poor Martha—monotone, kind, and so obliging that when her boss mentions he might have to fire her, she asks if it would be easier for him if she just disappeared—and Chip’s exasperated but involved mother, played without explanation or winks by a very wonderful Louie Anderson in convincing drag. This is a heavy setup for a comedy. Some, like Emily Nussbaum in the New Yorker, may find the show needlessly cruel and sour, seeing Chip as a self-involved jerk, interested, like his show, only in his own misery, and take the whole thing as a lesser example of the thriving subgenre of dude-mope. (Aside from Louie, see also: Togetherness, Man Seeking Woman.) I liked the show more than this, not because I found it so much funnier, but because I found it more moving. Baskets is deeply sad. Even its more straightforward comedic gambits, like an episode in which Chip trains a Juggalo to be a rodeo clown, eventually crash into ennui. Chip’s decision to mentor the Juggalo is as absurd as it sounds—there’s a scene where Chip and the Juggalo practice smelling imaginary odors—until it’s pitiable: Chip thinks he’s found a like-minded artist, when he’s just found a goofball in ICP makeup trying to make a living. But a comedy that inspires more pathos than laughter isn’t necessarily failed. It just might be mislabeled.